Carmina Arguelles, 92, of Ringwood, NJ, passed away peacefully on Thursday, March 22, 2018. Born in Perth Amboy, NJ and raised in Spain, she worked in the garment industry and was an avid seamstress. 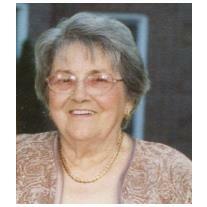 She was a devoted Catholic, and was a big fan of the NJ Devils, NY Mets, and Lakeland H.S. Soccer. Loving mother of Adela Primiano and her husband Nicky, and the late Joseph Arguelles. Dear grandmother of Marisa Van Orden and her husband Jon, and Steven Primiano and his wife Marija. Beloved great-grandmother of Jack and Juliana Van Orden, and Owen and Ethan Primiano. Cherished aunt of many nieces and nephews. The Funeral Mass will be celebrated at 10 AM on Wednesday at St. Elizabeth Church, 700 Wyckoff Ave., Wyckoff. Entombment to follow at Garden of Memories, Washington Twp. Visiting Tuesday 2-4 PM and 6-8 PM at the Feeney Funeral Home, 232 Franklin Ave., Ridgewood. In lieu of flowers, donations in Carmina’s memory to the Alzheimer’s Associations (alz.org) would be greatly appreciated.